Nice and sunny today with temperatures in the low 80s. 90s tomorrow and Monday. upper 80s tuesday and Wednesday, dropping to the low 80s Thursday and a chance of isoladed thunderstorms. More chances of thunderstorms Friday and Saturday with temperatures in the upper 70s. Back to the 80s and clear by Sunday. Water off most of the day yesterday. Off today until late when a unit will come on and off most of Sunday and even Monday until 3:00 p.m.
Darrell took Terry, from Defiance, and his friend, Tom, from Texas out for half a day Wednesday. Windy! and a couple units running. Very good outting for these guys mainly stripping the holographic green crackleback on a sinking leader. Mike, from Texas, spent the day with Carolyn They had a really good, fun day, mainly pulling streamers and exploring for new areas. Thursday, Jim, from Illinois, spent the day on the water with Carolyn. Another WINDY day, with one unit going. Great day for Jim on the black midge or lightning bug dropped from the big ruby. He also pulled some on the holographic green crackleback. It made Wanda’s day Friday to catch a pretty brown. 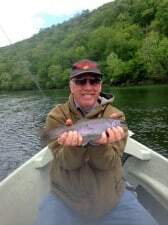 She spent half a day on the water with Carolyn catching on the silver head black midge early, and as the water dropper more, the black midge with a copper head. 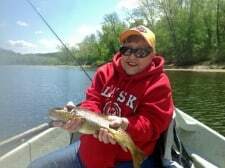 This entry was posted on Saturday, May 3rd, 2014 at 11:11 am	and is filed under Fishing Reports. You can follow any responses to this entry through the RSS 2.0 feed. You can leave a response, or trackback from your own site.